Your body's reaction to stress can damage hair follicles. Lack of minerals such as zinc or iron, and vitamins, may contribute to hair loss, as can ingested or external toxins. Chronic cellular inflammation weakens hair follicles. Pregnancies or fluctuations in hormone levels can cause hair loss. Inherited risk found in the androgen receptor gene. Male hair loss usually has a specific pattern, such as a gradually receding hairline and/or an expanding bald spot on the crown of the head. The cause is mainly down to androgenetic alopecia, which means it's an inherited trait. Hair loss can be classified in 7 stages, as below. Here it is important to stress that the earlier the condition is treated, the better the results. Female hair loss is mainly divided into 4 stages. Most usually it is seen in a widening of the parting and the thinning process can stretch over ten years. Again, it's important to seek early professional treatment. Consultants will examine and analyze your hair and scalp condition, ask you about your personal and family background, lifestyle and dietary habits, and suggest more advanced hair tests as needed to accurately determine the precise causes of your hair loss. From this information, a tailor-made treatment programme can be put in place. The first step to treating hair loss is an accurate diagnosis of your current hair and scalp condition. Instead of relying on visual inferences and experience alone, the In-Depth Hair Analysis (IDHA) allows a quantitative study of a person's hair and scalp condition. Hair loss conditions can then be identified based on these factual findings from the IDHA report. Not requiring any shaving or plucking of hair from the scalp, IDHA is able to capture specific details necessary for Svenson trichologists to identify the reasons for any current hair and scalp problems. This is a vital pathway to treatment and improvement. Svenson introduces top hair formulae from all over the world for daily hair care. Helps tackle all kinds of hair problems and reinforces the treatment sessions to deliver maximum results. 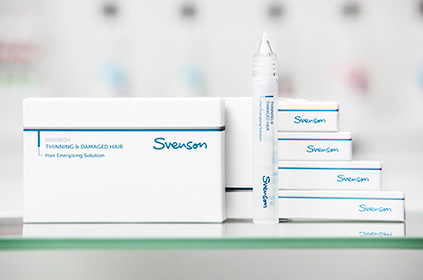 Svenson will regularly monitor the health of your hair and the progression of hair growth. Consultants will follow up your hair condition and enquire about your daily hair and scalp care and give advice where needed. Enjoy the sensation of a deeply cleansed scalp, free from sebum or stubborn build-up. Tiolisina Complex prevents dandruff, acne and irritation while the hair-strengthening Ayurvedica Mix also relieves any itchiness or dryness. Experience the difference when you gently deep cleanse and purify your scalp with natural ingredients. Glycolic Acid contains AHAs to remove layers of dull, dry skin and unclog follicles. Together, the Tiolisina Complex and Ayurvedica Mix will soothe your scalp and regulate sebum control to prevent clogged follicles, while also keeping your hair feeling refreshed and light. Strengthen your hair strands by stimulating follicles and enhancing protection with this daily shampoo. Specially formulated with Capsicum Fructescens, tea tree oil and Arnica, its potent combination also fights against premature hair fall as well as split ends. Speed up the process of reduced hair loss by nutrifying your hair right from the roots. Active ingredients such as Capsicum Fructescens effectively increases scalp microcirculation to ensure that sufficient nutrients are absorbed at the roots. The antibacterial Tea Tree oil keeps your follicles healthy and prevents clogging, while Arnica improves hair strand strength and vitality. Rejuvenate and strengthen hair from root to tip with this enriched hair pack, chocked full of essential nutrients and hair fortifying active ingredients. Hair is protected, and rendered radiant and soft overtime with this holistic nutrition pack. Nourish your scalp and hair like never before with key actives such as patented peptides, vitamins and botanic extracts. This potent blend creates the optimal scalp condition for hair regrowth, as it is released directly into the follicles using a unique double-layered encapsulation technique. Optimise hair growth with this clinically proven shampoo that contains patented peptides derived from 13 years of research and development. The peptides are pushed into the scalp to increase hair thickness. Build-up is also effectively removed without stripping your scalp of natural oils. For more than 60 years, Svenson has brought trichology to clients the world over. Our first Hair Centre opened in London in 1956. While the tools and techniques have since progressed at Svenson Hair Centres across Asia, our convictions remain the same: hair and scalp care that's committed, holistic and effective. Delivered by Trichologists who are International Affiliates (UK) of The Institute of Trichologists, and Hair Consultants who have your best interests at heart. Hair loss is no longer inevitable. #Consultant to recommend suitable treatment and frequency subject to client's hair and scalp condition. The promotion is valid till 31 May 2019. Applies to newly registered customers of Svenson Hair Centre (Hong Kong). Svenson reserves the right of final decision in case of any dispute. I have read and agreed with Privacy Statement, I am willing to receive product information and promotion materials from Svenson Hair Centres.